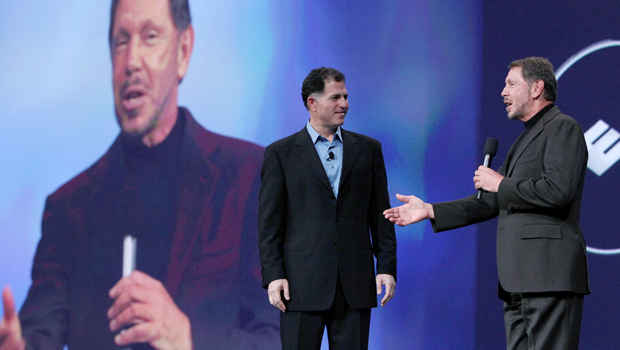 SAN FRANCISCO Michael Dell is about to find out if other bidders think his company is worth more than he does. The answer could come Friday, which marks the end of a 45-day period that Dell's (DELL) board of directors settled on to allow for offers that might top a Feb. 5 agreement to sell the personal computer maker to CEO Michael Dell and a group of investors for $24.4 billion. With the deadline looming, buyout specialist Blackstone Group (BLK) is emerging as the most likely candidate to trump the current bid of $13.65 per share. Blackstone is so intrigued with the prospect of owning Dell that the firm has been courting former Hewlett-Packard (HPQ) CEO Mark Hurd to run Dell if it decides to mount a hostile takeover attempt, according to a person familiar with the situation. The person asked not to be identified because the discussions between Blackstone and Hurd are considered confidential. Several other buyout scenarios tying Blackstone to Dell have been leaked to the media this week, another indication that the New York firm is mulling a bid that could scuttle the debt-laden deal that the company reached with Michael Dell and Silver Lake Partners. Dell says Friday's deadline for competing offers could be extended if its board believes other suitors would benefit from more time to examine Dell's books and hash out other details. The company, which is based in Round Rock, Texas, has promised to provide extensive details about the sales process in regulatory documents that are supposed to be filed next week. Although there is much rumor and speculation, many investors are convinced a higher bid is in the works. That's why Dell's stock price has remained above $14 for the past two weeks. The shares fell 19 cents Thursday to close at $14.14. Some analysts have even predicted Dell ultimately will be sold for $15 to $16 per share. Southeastern Asset Management, Dell's second largest shareholder after Michael Dell, has asserted the company is worth closer to $24 per share. For its part, the four-member board committee that negotiated the current deal maintains it's selling Dell at a fair price -one that reflects the dimming prospects for the PC industry as more technology spending shifts to smartphones and tablet computers. The upheaval is siphoning revenue away from both Dell, the world's third largest PC maker, and HP, the top PC maker. Both companies are trying to adapt by making more tablets and diversifying into more profitable areas of technology, such as business software, data analytics and storage. The rivalry between Dell and HP makes Blackstone's flirtation with Hurd a tantalizing twist. HP widened its lead over Dell during Hurd's five-year reign, but the company parted with its former CEO under acrimonious terms in August 2010. Hurd resigned after facing allegations of sexual harassment against an HP contractor. HP found no evidence of harassment, but concluded that Hurd had filed inaccurate expense reports. Since Hurd's departure, HP has struggled and its stock price has been cut in half in a slide that has erased about $45 billion in shareholder wealth. Hurd, 56, began working as president of business software maker Oracle (ORCL) shortly after leaving HP. He is given every indication that he is happy with his current job, which could lead to a promotion to succeed his close friend, Larry Ellison, as Oracle's CEO. Ellison, 68, hasn't set a timetable for stepping down. Analysts nevertheless see Hurd and Safra Catz, Oracle's chief financial officer, as the leading candidates to replace Ellison. Oracle declined to comment Thursday. Blackstone didn't return phone calls. Blackstone is only interested in bringing Hurd to Dell if it can't negotiate a deal on friendly terms, should it decide to pursue a bid, said the person familiar with the situation. The easier path would require Blackstone to win the cooperation and financial participation of Michael Dell, who is contributing about $4.5 billion in cash and stock to the deal that he worked out with Silver Lake. Under that agreement, Michael Dell would remain CEO of a company that would become privately held for the first time in 25 years. Blackstone also has discussed the possibility of Southeastern Asset contributing its 8.4 percent stake in Dell to a competing bid, according to The Wall Street Journal, which cited anonymous people familiar with the matter. Other Blackstone maneuvers under consideration would focus on buying just a part of Dell. Blackstone might try to buy Dells' financial services division in a partnership with TPG, another buyout firm, or General Electric's (GE) lending arm, according to the people who talked to the Journal. Dell's financial services division lends money to customers who buy its products. Another Dell shareholder, billionaire investor Carl Icahn, is pressing the board to forget about selling the company and paying a one-time dividend instead. In a letter to Dell's board earlier this month, Icahn proposed a dividend of $9 per share that would require Dell to take on billions of dollars in additional debt. Shareholders would profit further if Dell is able to engineer a turnaround that drives up the stock price. Michael Dell believes he will be in a better position to overhaul the company if he no longer has to worry about Wall Street's focus on profit fluctuations from one quarter to the next.